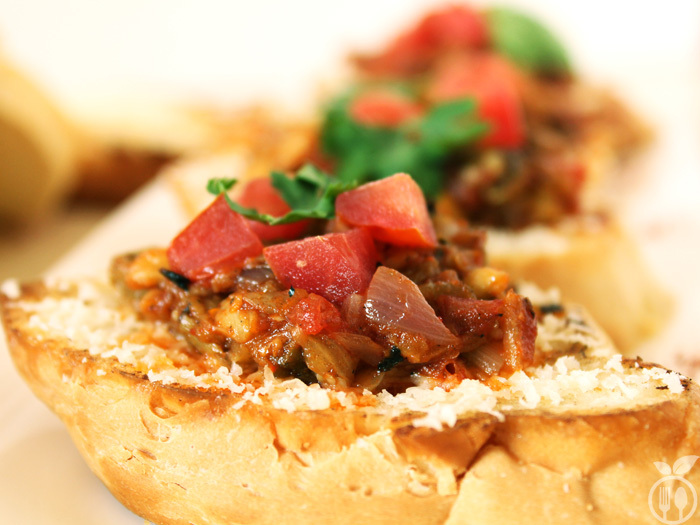 Roasted Eggplant Tomato Bruschetta Recipe – A perfect Italian Bruschetta Recipe with smoky roasted eggplants, tomatoes and onions as main ingredients on top of a french bread slice. When it comes to bruschetta, I don’t know why tomatoes always take all the credit!!! Check out in the market, you will find other best veggies like onions, eggplants, and zucchini and try something new on top with bruschetta bread. For Italian cuisine, there is no vegetable more Italian than eggplant and in India, cooking eggplant on the stove, brings out its best taste and intensifies its flavor. Every Indians know the smoky eggplant recipe. We all know typical Indian smoky eggplant recipe known as “Bhadatha recipe”. This Roasted Eggplant Tomato Bruschetta recipe brings out the deep and best taste of eggplant and also combines the savory of tomatoes and garlic. Flavors are so balanced that this smokiness of eggplant will make you crazy and you wanna try again and again. Once I have started to learn Italian cuisine, always pasta and pizza comes in my mind. I created special valentine recipe Heart shape pizza and easy way to create best veggie lasagna recipe for you. But those did not convince me, the way I am making everything with Indian touch. It is a simple way to make new Italian dish with Indian style! And if you are running out of party ideas I am damn sure this recipe makes your party unforgettable, because every aged people do like this recipe. When I made this first time, my mom was hesitate to taste it, because she is fond of Indian food and I told her that I was making Italian. But once she tasted it, she asked for more. 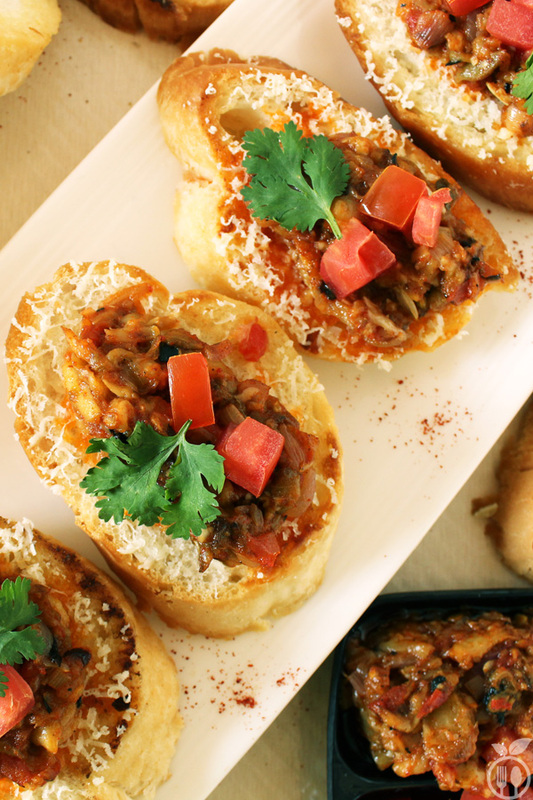 Roasted Eggplant Tomato Bruschetta Recipe – A perfect Italian Bruschetta Recipe with smoky roasted eggplants, tomatoes and onions as main ingredients on top of a french bread slice. Take a big size eggplant. Grease with oil, and put on gas directly. Roast it until its black skin burns completely. It will take around 15-20 minutes. You can grill it. For grilling, make slices from it, brush it with oil. When griller is ready, grill them until grill marks appears and slices are nicely browned, 3-4 minutes on both sides. Once it is finely smoked and cooked, let it be cool. Remove black burned skins from eggplant. Now cut it into small pieces or finely chopped or mashed it. Take a pan and heat oil, add minced garlic and just sauté it for 5 seconds, and chopped onion and tomato into it. Cook it for 5 minutes, now add your smoky eggplant, and mix it well. Do the seasoning. Add salt and red chili powder into it. You can add just pinch of sugar to balance the taste. Again simmer for just 2 minutes. Topping is ready to use. Broil or toast the bread with butter. Then put some cheese on that, I am using simple grated processed cheese but feta cheese also goes best with it. 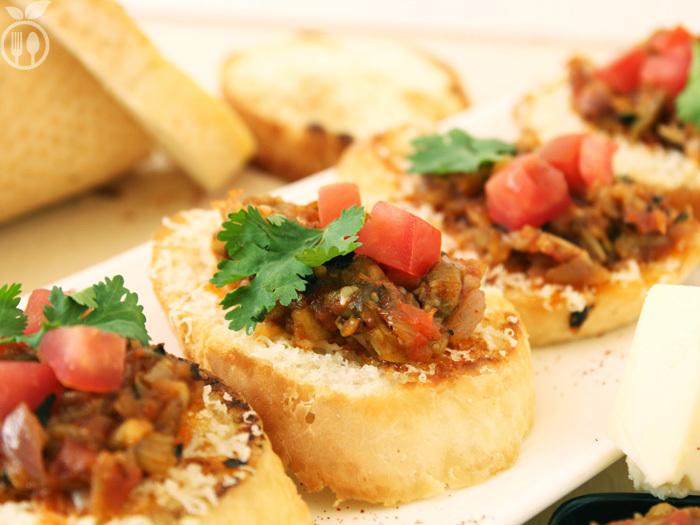 Add 1 tbsp eggplant mixture on top of bruschetta and serve with your favorite drink. 1) You can balance spiciness according to your taste. 2) You can use chili flax instead of red chili powder. You can cook eggplant directly on stove or use grilling stand for roasting on stove. But to get best taste come out form it, I suggest that directly cook it on stove. If you want grill it then slice the eggplants. Drizzle with oil on both sides, grill it until marks appears on both side of slices. 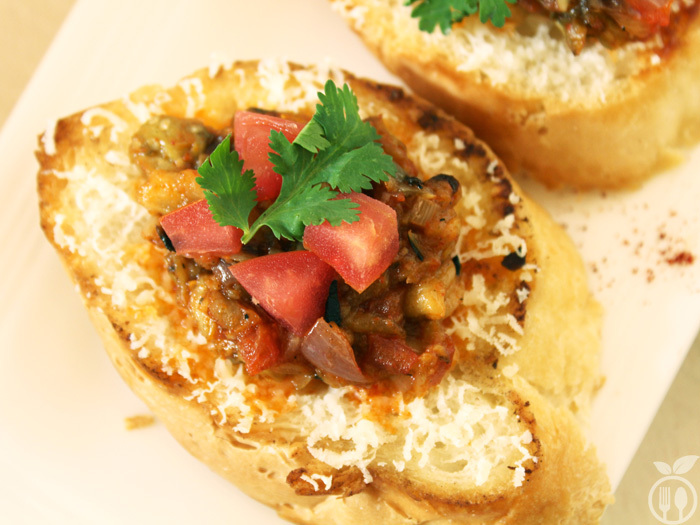 At the time of serving, just roast the bread, use some cheese and at top add 1 tbsp if this eggplant mixture. You can very amount of cheese according to your choice. This looks so delicious !! 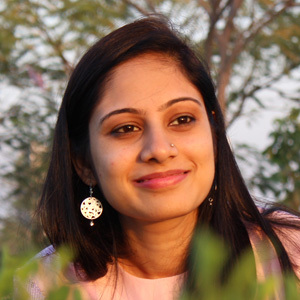 another great recipe..good job Reena Vyas !.